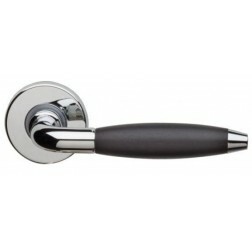 Door handle R744 by Ghidini, made of brass and aluminum. Special design distinguishes this handle. 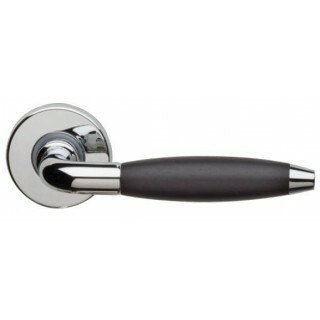 Slim and squared hand grip realized in solid brass and black rubber, placed on round rose. All Ghidini accessories are subjected to quality control both aesthetic and mechanical, in fact test on durability has demonstrated that average resistance is 280,000 cycles before the handle will break, 80,000 more required by the European legislation. Recall also that Ghidini Pietro Bosco is an Italian company that exclusively uses quality materials in production processes.